Benedict’s Test is used to test for simple carbohydrates. The Benedict’s test identifies reducing sugars (monosaccharide’s and some disaccharides), which have free ketone or aldehyde functional groups. Benedict’s solution can be used to test for the presence of glucose in urine. Some sugars such as glucose are called reducing sugars because they are capable of transferring hydrogens (electrons) to other compounds, a process called reduction. When reducing sugars are mixed with Benedicts reagent and heated, a reduction reaction causes the Benedicts reagent to change color. The color varies from green to dark red (brick) or rusty-brown, depending on the amount of and type of sugar. When Benedict’s solution and simple carbohydrates are heated, the solution changes to orange red/ brick red. This reaction is caused by the reducing property of simple carbohydrates. The copper (II) ions in the Benedict’s solution are reduced to Copper (I) ions, which causes the color change. The red copper(I) oxide formed is insoluble in water and is precipitated out of solution. This accounts for the precipitate formed. As the concentration of reducing sugar increases, the nearer the final colour is to brick-red and the greater the precipitate formed. Sometimes a brick red solid, copper oxide, precipitates out of the solution and collects at the bottom of the test tube. Sodium carbonate provides the alkaline conditions which are required for the redox reaction. Sodium citrate complexes with the copper (II) ions so that they do not deteriorate to copper(I) ions during storage. Complex carbohydrates such as starches DO NOT react positive with the Benedict’s test unless they are broken down through heating or digestion (try chewing crackers and then doing the test). Table sugar (disaccharide) is a non-reducing sugar and does also not react with the iodine or with the Benedict Reagent. Sugar needs to be decomposed into its components glucose and fructose then the glucose test would be positive but the starch test would still be negative. Benedict’s solution is a deep-blue alkaline solution used to test for the presence of the aldehyde functional group, – CHO. One litre of Benedict’s solution can be prepared from 100 g of anhydrous sodium carbonate, 173 g of sodium citrate and 17.3 g of copper(II) sulfate pentahydrate. Approximately 1 ml of sample is placed into a clean test tube. 2 ml (10 drops) of Benedict’s reagent (CuSO4) is placed in the test tube. The solution is then heated in a boiling water bath for 3-5 minutes. 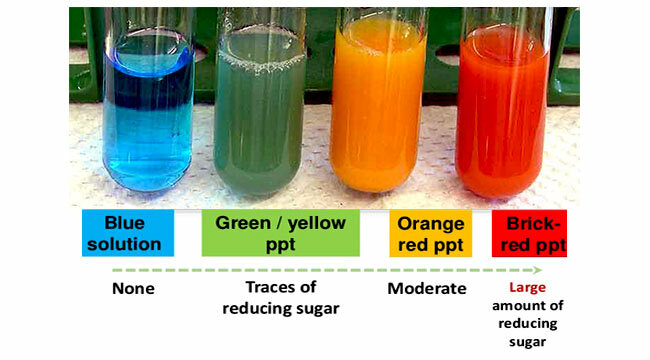 Observe for color change in the solution of test tubes or precipitate formation. If the color upon boiling is changed into green, then there would be 0.1 to 0.5 percent sugar in solution. If it changes color to yellow, then 0.5 to 1 percent sugar is present. If it changes to orange, then it means that 1 to 1.5 percent sugar is present. If color changes to red,then 1.5 to 2.0 percent sugar is present. And if color changes to brick red,it means that more than 2 percent sugar is present in solution. Negative Benedict’s Test: No color change (Remains Blue). Reducing sugars absent. Example: Sucrose. National Institutes of Health, Testing for Lipids, Proteins and Carbohydrates- Benedict’s solution. Fayetteville State University- Biological Molecules: Carbohydrates, Lipids, Proteins. National Biochemicals Corp.- BENEDICT’S SOLUTION (MB4755). Science Olympiad- Use of Benedict’s Solution. Brilliant Biology Student 2015- Food Tests- Benedict’s Test for Reducing Sugars. University of Manitoba- The Molecules of Life: Biochemistry- Carbohydrates. Northern Kentucky University- Benedict’s Reagent: A Test for Reducing Sugars. KNUST Open Educational Resources, Benedict’s Test – Qualitative Test in Carbohydrates. Mark Rothery’s Biology Web Site- Biochemical Tests. All Medical Stuff- Benedict’s test for reducing sugar. Hendrix College- Benedicts Test for Glucose. Amrita Virtual Lab Collaborative Platform- Qualitative Analysis of Carbohydrates. 1 ml is approximately 20 drops. So 2 ml would be 40 drops. 10 drops would be 0.5 (1/2) ml. What should the protocol say? There is one major problem in this writing….you’ve said Hydrogens are electrons. Hydrogens are protons…often, having given away an electron, they acquire a positive charge. Will it detect the presence of lactobionic acid? What happens if you keep on heating the solution in boiling water bath for more than 5 minutes? I made this mistake while working with Benedict’s Reagent, it burns the reagent and the substance you are testing creating an odd off colour that should not be used as sound results in a report. It is also quite difficult to clean any glassware after that mistake. Do it is also known as fehling’s test for reducing sugars???? Does Formica acid give benedict test?? Hydrogens are not electrons, they are protons and often have a positive charge. Is it possible that the sugars are reducing sugars because they accept hydrogens instead of give them up? I would like to know the precautions while using the solution.